Our popular Indoor/Outdoor bodysuit is now available for Pugs! 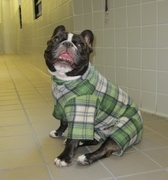 It is a medium weight fleece that can be worn inside and out. The Indoor/Outdoor bodysuit is an excellent choice for Pugs in mildly cold to cold weather. The Pug indoor/outdoor bodysuit stretches for easy on/off, resist rain, and is machine washable and dryable.